Both your fiancee and you will need to go to The Marriage License Bureau and complete an Application for Marriage License between the hours of 8:30 A.M. – 4:30 P.M (Monday – Friday). This is located on the 1st floor of the City County Building at 414 Grant Street, Pittsburgh, PA. It costs $75 for the marriage license Allegheny County suggests that you “obtain a Marriage License 2 to 3 weeks before the scheduled date of their marriage ceremony”, but it typically takes 3 days from application to receive your marrige license and it is good for 60 days. If you have a child / children, DO make your child / children the 1st you tell about your plan to get married. Address any concerns and plan to involve your child / children as much as possible. This will help your child / children accept and transition comfortably as it is not always easy for children to accept that another person shares your love. DO tell your parents first, and then announce your engagement to family and friends at one time. You can send wedding announcements, launch a wedding website, post an announcement in the Celebrations section of the Pittsburgh Post Gazette or host a dinner party. This serves a vital purpose in setting your wedding date, therefore you want to announce and start discussing with everyone to insure that they are available or can make adjustment to attend on the day you want to get married. DO start planning A.S.A.P. 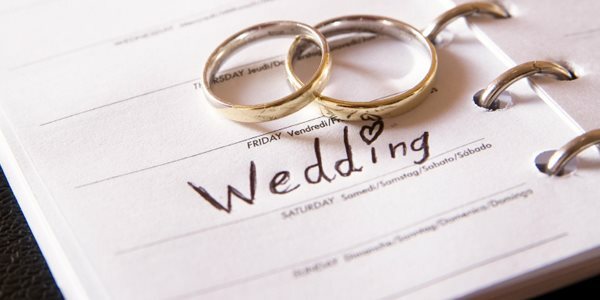 ~ set the wedding date, plan your budget and get ready to organize every single detail of your special day ~ Disorganized weddings are embarrassing, therefore you will want to rely on family and friends for help or hire a professional wedding planner. The goal is to create an occasion that is positively memorable for all. DO NOT move forward blindly. You need to follow your budget starting with obtaining the marriage license all the way to honeymoon plans and when thank you cards should go out to your guests. There is a lot in between the two, therefore DO use a Wedding Planner w/ Worksheets to help keep your budget in perspective. It might change a few times as you are doing the initial research and cost analysis. Once you have set a budget for each detail, DO stick with the amounts that you are allocating to each detail. DO NOT plan your wedding around major Holidays (including St Patrick’s Day, New Years Eve / Day and dates for different religious practices). Additionally, DO NOT plan to your wedding on Super Bowl Day, Final Four, The World Cup, The Olympics, The World Series or other major sports events. Friday the 13th, April Fools Day, Homecoming Dance / Prom Season and around local Pittsburgh events are dates that you should forget about hosting your wedding, too. Even more importantly, NEVER plan your wedding date for the same day as other friends, work associates and family members. Make venue or other adjustments if necessary, but DO NOT schedule conflicting wedding days for any of these reasons. DO plan to wear comfortable shoes (have them custom made if need be) during rehearsal and on your wedding day. This is supposed to be one of the best days in your life, therefore it makes no sense to torture yourself by wearing uncomfortable shoes (no matter how cute or beautiful they are on your feet). Planning your wedding can become an overwhelming and time consuming project. Make sure to take good care of yourself by eating healthy and getting plenty of rest (during the planning process and up to your wedding day). Please! Please! Please! DO NOT torture your brides maids by making them wear ugly dresses. Although it is hard to please the masses, there is nothing wrong with asking their opinion and taking a vote on the final dress options. DO NOT wait until the last minute to select and reserve your wedding transportation. Our Pittsburgh Limousine company is always available to answer your question, give you a tour of our FLEET, online limo quotes and help you by phone @ 412-606-9549. Last Minute Wedding Planning - Lets face it! Pittsburgh is not Las Vegas. We do not have wedding chapels on every block nor do we have all-inclusive $75 wedding packages that make exchanging vows more affordable. It is just not that easy to plan a last minute wedding in Pittsburgh, but couples do it all of the time. Whether you fly to Las Vegas for an Elvis theme or cruise to the Caribbean for a beach wedding / honeymoon combo, marry in your church or home garden, the point here is that there is always a lot of planning involved … even for last minute weddings as the Justice of the Peace and Officiants do not always return calls when they are busy. Think accordingly so that you are no disappointed and have all arranged well. Winter Wonderland Weddings – Although a fresh snowfall makes Schenley Park and Mt Washington views all the more beautiful, the slush comes all to quickly. It really does take proper planning to pull off a winter wonderland wedding theme. This is especially in consideration of not inconveniencing your wedding guests and dirtying bridal gowns. The advantage of a winter wedding is that you have so many more color, floral and venue options. Plus, there is tremendous room for creativity and daring to try new things. Guest will also enjoy pulling out their fur coats, cashmere and leathers; walking on clean walks and red carpets instead of snow; the excitement of the luxurious feel of attending a wedding in full formal attire opposed to the weather being so warm that it limits their comfort. On the other hand, winter is always ideal for the increasingly popular beach weddings in Florida, Hawaii, California, South Carolina, Caribbean Islands. This works best if family and guests can afford to join you out of state. Niche / Theme Weddings – As you can imagine, many wedding planners and brides to be have been inspired by the Royal Wedding and unique celebrity themes. These niche matrimonies have turned heads and warmed hearts worldwide in addition to the awe over the glam of trendy new fashions. There is nothing wrong with using these niche wedding themes for your wedding. Compliment the themes with elements and palettes that reflex “YOU”, but have fun stepping into their well planned fantasies. Whether you are planning a last minute wedding or winter wonderland theme, Our Pittsburgh limousine company has the perfect wedding limos and luxury buses for your blessed event. Request a free QUOTE online or contact us directly at 412-606-9549 today!